Mediacurrent is proud to announce the launch of a completely rebuilt and retooled corporate website for Manhattan Associates. 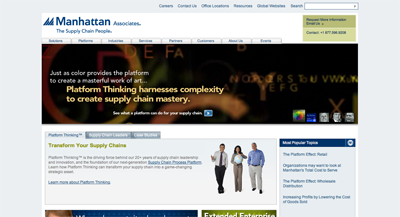 Manhattan Associates is a publicly traded, Atlanta headquartered company that is the global leader in international supply chain management. Mediacurrent launched a single Drupal installation powering six fully translated language versions of their primary website. This allowed Manhattan Associates to serve targeted marketing materials and company resources to all of their global vicinities. Furthermore, the site makes good use of the top Drupal contributed modules and custom code. This allows users to find the content they need and efficiently lead them to relevant information. The site also serves marketing materials in a variety of media formats, from video and audio to dynamic Flash presentations. Mediacurrent was able to help re-launch a more robust site and assist with translation issues the legacy site had. The new website allows Manhattan Associates to seamlessly push data to sites, while allowing their team to easily manage all of their content in a single location. Mediacurrent was able to combine the i18n and Domain Access modules to allow for publishing of translated and non translated assets across multiple domains. Resources are now more easily accessible through a Views based resource library that allows multiple pathways to access the content. This includes a content specific sidebar and filterable silos of archived data. By choosing this particular architecture set-up, Manhattan Associates will be able to easily create targeted marketing microsites without duplicating content and wasting effort. In addition, we also integrated the Eloqua CRM with the resource library and contact forms, empowering Manhattan Associates to learn about potential leads through interest in materials and targeted contact form submissions. To complete development, Mediacurrent was able to use Drupal best practices and system performance features to deliver much better website speed across all domains compared to the legacy implementation. We’d love to hear from you – any feedback on the site would be welcomed!